At the outdoor market, West Virginia farmers arrive daily with a fresh abundance of seasonal items for your home & garden. Spring flowers, shrubs and trees - Summer fruits and vegtables - Fall pumpkins, gourds and cornstalks - Holiday Christmas trees, wreaths, swags and garlands. 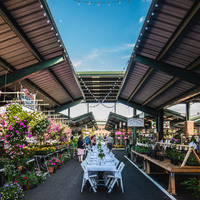 Our indoor market features a variety of speciality shops, a tempting selection of lunch options, tasty treats and indulgences, literary delights, a healthy sampling of West Virginia specialities...everything from fresh simple food fare to gourmet pleasures and a fine Italian restaurant. It's a fresh way to shop!